Helio and his son Ashton Leal from Boston, Mass. Caught these giants and many more beauties on live wild shiners today. Couldn’t have asked for more perfect weather and day. The fish started slow this morning but when the sun came up boy did they turn on. 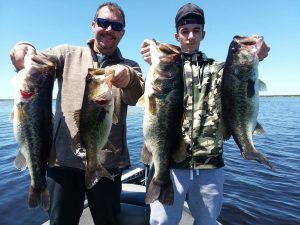 We still have some availability for the upcoming weeks so if you ever wanted to visit a beautiful lake and catch some lunkers NOW is the time. 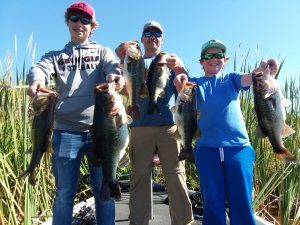 Steve Ammons and his 2 sons Rhett and Riggs had the best day of their young lives bass fishing with Okeechobee Bass Fishing and Okeechobee Fishing Guides catching tons of BIG bass including Rhett’s 9 lb bucket lips. These boys hadn’t made it back to the dock before they were begging their dad to come back next year. What a joy it is for us to be able to play a part in kids love for the outdoors and fishing. Looking forward to seeing you boys next year thanks for coming! 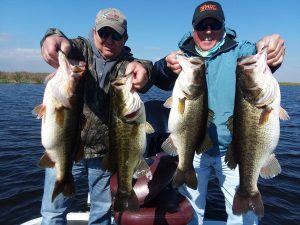 Bill Gersh and his son had a great day with Okeechobee Fishing Guides catching a mess of bass including these 2 beauties you see in the photo. We have been having really good luck in the afternoon trips as well as the morning trips. The weather has been perfect and the wildlife is starting to prepare for Spring. We saw tons of big alligators, birds, and caught a few different species of fish that attack a shiner as well. 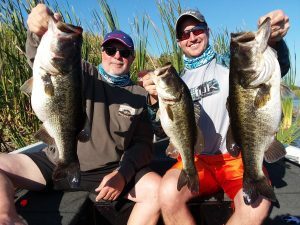 Now is the time to book your trip for the upcoming Spring spawn. 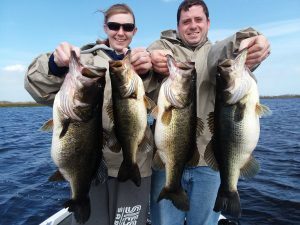 Join us and the lots of others who caught their personal best with Okeechobee Bass Fishing. 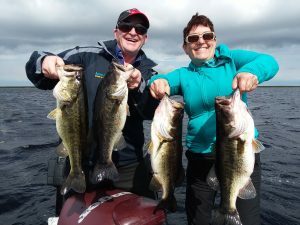 Mark Burton and his wife from Canada enjoyed a great day out with Okeechobee Fishing Guides Nathan Shellen and Okeechobee Bass Fishing. The weather was cold for me but they enjoyed getting out of -20 or lower temps. they have been getting in Toronto. We caught 32 bass including these 4 nice fish the biggest being 5 lb. 11 oz large mouth. The fishing has still been good considering how cold the water has gotten over the last few days. I had the pleasure of fishing with Lauren Walker and her boyfriend both from Mass. 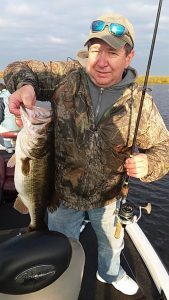 Chris is an avid fishermen and loves the outdoors as well as bass fishing. 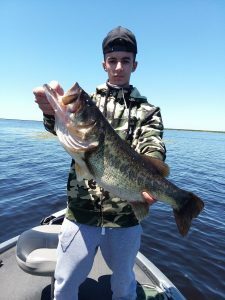 He came to Okeechobee to catch that GIANT large mouth and it turned out that Lauren was going to give him some lessons in fishing and humility. 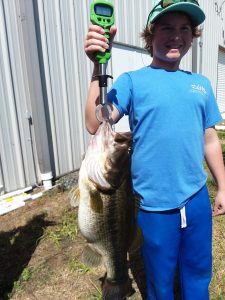 She caught the 3 biggest fish of the day with the largest being just under 7 1/2 pounds with a few others in the 4- 5 pound range. The water is cleaning up and the fish are turning on. The big fish are moving up to in preparation for the up coming full moon.